A few nice people saw their potential and gave them a make-over. Now I am a proud member of one of the, if not THE, most stylish of all terriers breeds, sporting my Mary-Had-A-Little-Lamb look (even though I'm not exactly white). My coat does not shed much at all, making me a first choice pet for people with allergies. You do have to be handy with the scissors and shears to keep my hair-do looking smart � or I can go to a professional groomer, if you prefer. I am energetic and easily trained to fit into your family situation. When fully grown, I am between 15 and 17.5 inches tall (38.1 to 44.5 centimeters) and I weigh between 17.5 and 23 pounds (7.9 to 10.4 kilograms). We have no Bedlington Terrier Breeders listed at this time. 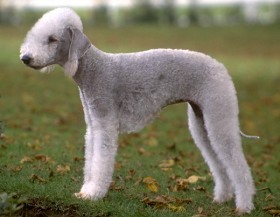 Click here to place your Bedlington Terrier Ad!